Materials used: goat hair, brass ferrule, wooden handle. The GSN Series GSN-5 is a liquid foundation brush with bristles made from the hairs of goat. 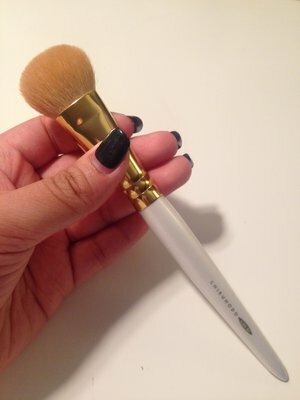 After applying foundation on skin with clean fingertips, use brush to gently stipple and blend in foundation. To help brush absorb little to no foundation, gently mist brush hairs with water before use. “The GSN series is designed to work seamlessly with a variety of makeup brands. 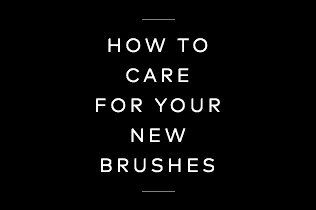 These are all-around brushes for both pros and novices.” See the lookbook for the GSN Series here. First look: very similar to the Real technique's expert face brush, but once used, this is so much better. This is less dense, thus absorbs less product and blends like a dream. 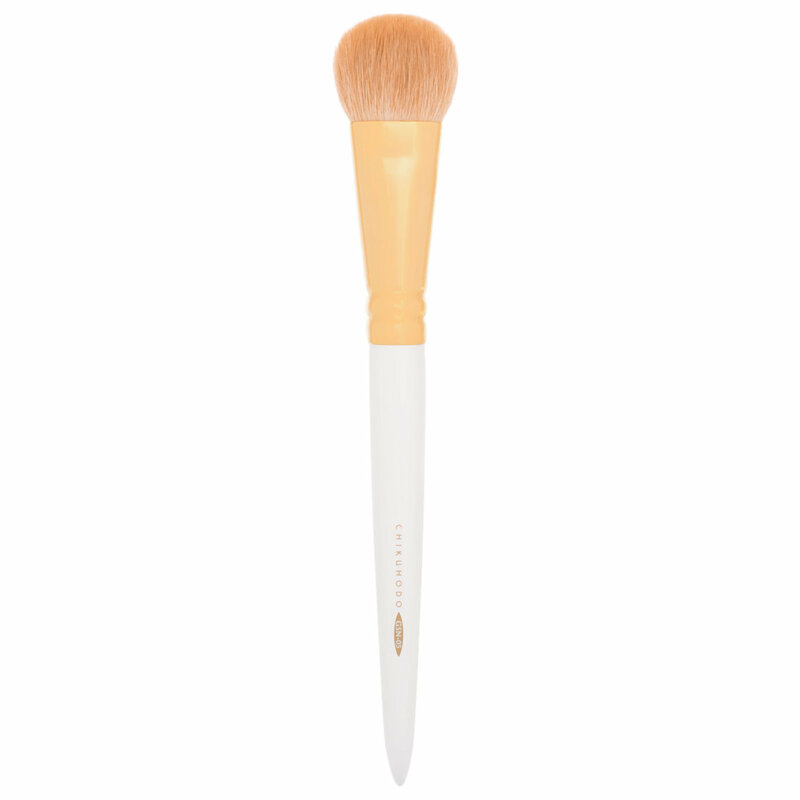 Can be used with a buffing motion or the way you use a flat paddle brush, both creates a flawless base. Con: If you don't wash this once in a while, it will make your application streak. I absolutely love this brush. 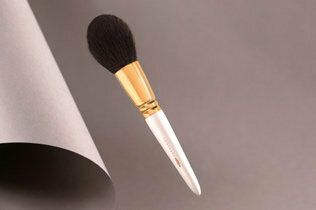 For years I used my fingers to apply foundation, then experimented with Armani's Blender Brush in sable hair. That brush is ok, but I found myself longing for a denser brush that wasn't as flat, and that I could use not only to apply makeup but buff and blend as well. I bought the Tom Ford liquid foundation brush but something about it didn't appeal to me, and I returned it unused. 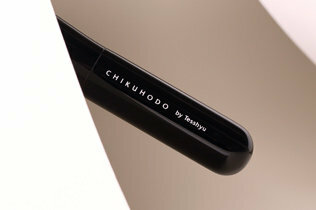 I did a lot of research before deciding on Chikuhodo's GSN-5 liquid foundation brush. I use it every morning and I absolutely love it. It applies liquid and cream foundations gorgeously. The thinnest foundation I use is Charlotte Tilbury's Light Wonder foundation. The GSN-5 handles it beautifully. The brush is so dense that the foundation does not run up into the fibers or the ferrule, and does not streak when I apply this thin foundation. It also works beautifully with slightly thicker Armani Lumnous Silk foundation, which I also love. And it works great with my thickest foundation CT Magic Foundation, which I also love. The brush applies makeup smoothly without streaks, and moments after applying it, I use the same brush to work the foundation into my skin and buff it. The brush is soft enough that it doesn't micro-exfoliate my skin (I have sensitive red skin) but it has just the right amount of stiffness that it does its job. I really, really enjoy putting my make up on with this brush. I've washed it twice and had absolutely no issues with shedding (maybe one or two loose hairs). I'm planning to buy a second one soon. One last thing - I don't understand the comments that say the hair on this brush is ugly! In my opinion, it's gorgeous. The hair is blonde, and theres so much of it that the brush is dense. The brush hair color is a good match for foundation skin tones. My foundation looks great on the brush, and great on my face. Could be softer! But not a bad deal. This brush is my first foray into Chikuhodo. I picked it because at $40, it wasn't gonna break the bank if it's not as soft as my holy grail foundation brush, the Hourglass No. 2. It's packaged in a plain plastic cover, so not super luxurious, but it doesn't bother me because my Hourglass brushes were packaged the same way. It's got a long and tapered handle with a golden ferule--it looks very luxurious whenever I use it. The brush hairs, however, could be a lot softer. It was off-white/yellow and scratchy straight out of the box, but fluffed up enough after washing. It doesn't really absorb a lot of product (unlike my Hourglass brush) so that's a plus. The hairs are dense and short enough that you could hold this brush one way to swipe liquid foundation on, and then hold it perpendicular to your skin to buff it out. Overall, it is a great value for the money. I just wished the hairs were a lot softer. Con's: I'm very disappointed, to say the least, because from the moment that I first received this brush and used it, that this high quality brush began shedding on my face. I am very gentle with all of my brushes because they are an expensive investment, so this is frustrating. I had hoped that the shedding would stop after a couple times of use. No such luck. I read other peoples reviews and read nothing about them having shedding issues, so I must have a defective brush or something. I had plans to purchase not only a second one of these but more from this line, but now I am not so sure if I should or not. Besides the shedding I really DO like this brush.. I wanted to love it ( I would have loved the brush, if the shedding wasn't so frequent). I would have recommended it to others and I also would have given it 5 stars- had it not been for the shedding. *The Many Pro's: This brush is a beautifully crafted brush. I personally, adore the color of these goat hair bristles, that are cut to visual and functional perfection. This brush airbrushes liquids and creams like a dream. This brush can work well with powders, as well as it can with liquids and cremes. The brush has a nice size to it so that one could use it for many uses like: foundation, blush, contouring, bronzer, etc.... You name it, the size of this gorgeous work of art can and will get it done, getting it done very well. It works so hard it leaves you with the gift of a furry face... and you know us ladies just love a furry face. This brush is also as soft as silk on your face which is great and expected. To sum it up this brush is almost perfect except for the reason stated and would be 5 star awesome if only it didn't shed quite as much as it does. *The delivery speed and care taken by "Beautylish" to wrap and to deliver my package and the goodies within was, AS ALWAYS, well done, professional, and personal....making me feel special in the way that "Beautylish" always takes the time and care to do. I will never use another brush for creamier foundations! I know the GSN-5 is marketed as a liquid foundation brush (personally I prefer the GSN-2 for that purpose), but this works so well with cream formulas; think the KGD Moisture Foundation, rms un cover-up, and RCMA foundation. It's dense so it blends out creams effortlessly without leaving streaks, and the smaller brush head is great for precision application. You really can't go wrong with the GSN series! Can you hear the angels singing??!! Well you will...this brush is amazing! I own the Suqqu line and most of Chikhodo Z series brushes but I needed a brush with firmness and density but still super soft for my cream products like Chanel Bronze Universal, cream foundation and blushes. Also the cut needed to be right. The shape is perfect for chiseling out your cheek bones and jaw line when used on it's edge then flick up or down to blend. It applies blush like a dream and buffs everything to perfection. I am going to order a back-up (which I rarely do) so I can have 2 in rotation all the time! The hair is definitely not the most attractive (it's quite thick and yellow) but this is one of my all-time favorite tools to apply and blend any face products but especially foundation. I also use this brush to fix/buff out any mistakes (i.e. too much blush/highlight). I can't recommend this brush enough! I really wanted a natural hair liquid foundation brush that would go easy on my aging skin but do a fine job with distributing product, buffing, and produce a fine finish to my foundation. Done, done, and done with this brush. I love the color of these natural bristles. I need a back up for this one. I don't want to be without it.